Koe drew the four-foot with last rock to get the win before a noisy, near-capacity ENMAX Centre crowd that exploded when his stone came to rest. 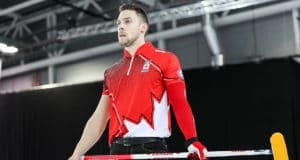 The win moves Canada into Sunday’s gold-medal game of the Pioneer Hi-Bred World Men’s Curling Championship, presented by Service Experts, Heating, Air Conditioning and Plumbing. Canada will play defending champion Niklas Edin of Sweden Sunday at 5 p.m. MT. “I wanted an outturn draw in the extra, I was really confident in my draw weight. I missed one in six and after that I knew I had it locked in,” said Koe. “I would have preferred a wider edge of rings draw to four-foot, but you know what, I had thrown that one a couple of ends earlier. Koe, third B.J. 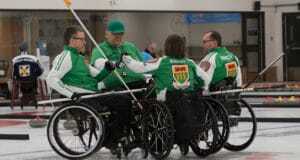 Neufeld, second Colton Flasch, Hebert, alternate Ted Appelman, team coach John Dunn and national coach Jeff Stoughton, got a deuce in the second, one in six and two in nine. de Cruz, vice-skip Benoît Schwarz, who throws fourth stones, third Sven Michel, lead Valentin Tanner, alternate Claudio Pätz and coach Thomas Lips, countered with singles in three, five and 10 and two in eight. While it was a draw that ultimately was the deciding shot, it was an outrageous quadruple take-out in the third end that still had people buzzing. After just missing on a runback double takeout and facing four Swiss counters with his last rock, Koe showed his magic by cleaning out all four stones and leaving himself counting two. Schwarz had to draw for Switzerland’s first point. Instead of firing up his Canadian teammates, the shot seemed to inspire the Swiss and even Koe didn’t have enough magic in the fifth. With both teams shooting at 90 per cent efficiency, or better, scoring was at a premium and stealing even more difficult. The Swiss did it, however, in the fifth. They buried a counter early and Canada never could get it out, leading to a steal of one and a 5-5 tie. Curling with the precision of a Swiss Army knife, de Cruz and company forced Koe to take one in the sixth, blanked the seventh, and jumped on misses by Flasch and Neufeld to score two in the eighth. But Canada turned the tables in nine. Canada had a nearly three-minute discussion before Neufeld’s second shot, a hit-and-stick, put Canada in position for a possible three. But Schwarz made a nifty double and Canada settled for a deuce and a 5-4 lead going into 10. Koe forced Schwarz to draw a piece of the button in 10 and fortunately for the Swiss, he was 100 per cent on his draws all game and made it to score a single and force the extra end. Switzerland will play in Sunday’s bronze-medal game at noon against Yuta Matsumura of Japan, who lost 8-2 to Sweden in the other semifinal earlier in the day.